Rumors that Apple would be launching a "GarageBand for ebooks" to enable textbook makers to generate content and "digitally destroy" the textbook publishing market do not appear to be the actual focus of this week's education-oriented Apple media event. Instead, according to report by Fortune writer Philip Elmer-Dewitt, Apple will be promoting new partnerships with publishers to use iBooks as a distribution platform in order to help push sales of iPads among schools. "Apple is not trying to kill the incumbents," the report cited Inkling digital textbooks publisher Matt MacInnis as explaining. "They've learned their lesson from upending the music industry." MacInnis had previously explained to Ars Technica that "practically speaking, Apple does not want to get into the content publishing business," but that site's report on Apple's plans kicked off speculation that the event would orbit around a new content production tool it dubbed "GarageBand for ebooks." Digital ebook content is currently distributed in a few major formats. Apple's iBooks app supports both standard PDF documents and EPUB, an open format based on standard HTML and CSS. EPUB ebooks are essentially self contained web pages, and can be created with virtually any web development tools. This includes Apple's Pages 09, which can output any word processing document into the EPUB format for use on iOS devices using the free iBooks app. Apple's EPUB support in Pages and iBooks works with embedded video, automatically creates a Table of Contents for navigation, and allows iBook users to add notes to ebooks they are reading. However, the EPUB format is fairly limited; Pages does not support creating more sophisticated ebooks using its page layout features such as including columns of text, headers and footers, and floating graphics, for example. More complex documents can be exported for use in iBooks as a PDF, which can depict virtually anything. However, PDF files lack features specific to ebooks, such as support for read-aloud content that highlights text as a narrator voices the text. This support requires sound recordings to be included in the document, a feature exclusive to the website-like EPUB. 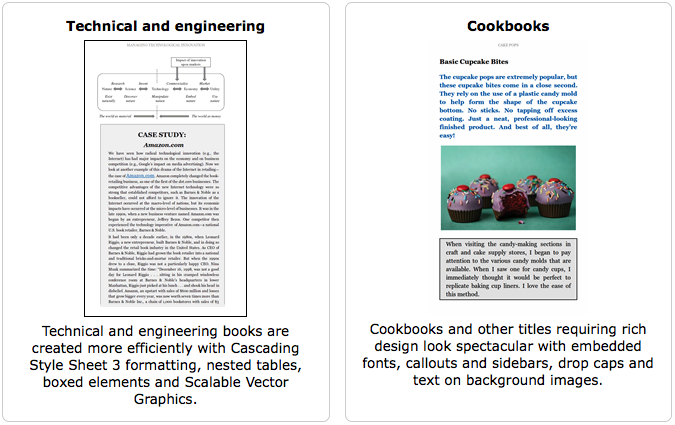 Users can manually create EPUB packages or use Apple's Automator or AppleScript to automate the publication of text, videos and graphics as self-contained ebook files. Third party software is also available to produce standard EPUB documents compatible with iBooks. Last fall, Amazon introduced a new format for its Kindle ebooks, which only work on Kindle hardware and its multi platform Kindle apps, such as those it offers for iOS devices. Publishers who create KF8 content must do so using Amazon's Kindle Publisher Tools and can then only sell it through the company's Kindle market, as it only works on devices using the Kindle app. This also subjects publishers to Amazon's terms of service. Rather than focusing its announcement on a new production tool for creating new ebook content usable on iPad, Apple is likely to promote partnerships with textbook publishers, similar to how it partnered with music labels on iTunes without delivering all the music production software they might need to create the songs they sell. Apple subsequently promoted iTunes' expansion into episodic TV shows, music videos and then theatrical movies with studio partnerships. And while Apple sells both Final Cut Pro and Logic Pro tools, there is no real link between the sale of content in iTunes and the creation of that content with Apple software. Since the development of iOS, Apple has also partnered with software developers. In that market however, Apple not only delivered all the tools to create iOS apps, but also required that developers only use its tools rather than supporting existing software written using Java, Flash, or other middleware tools that bypassed Apple's Xcode. In choosing open standards for iBooks content, Apple appears to be interested in allowing textbook developers to produce their own EPUB works they can then sell in the iBooks Store or through other venues, rather than following Amazon's strategy and forcing them to use a specific, non-standard format they can only sell through iBooks. MacInnis noted that "publishing something to EPUB is very similar to publishing web content. Remember iWeb? That iWeb code didn't just get flushed down the toiletI think you'll see some of [that code] repurposed." However, Apple's now discontinued iWeb was not a serious web development tool; it was essentially a variant of Pages that enabled users to lay out content in an easy to use Keynote-style and then generate HTML that could render the compilation in a browser. The HTML code it generated was bloated and messy however, far from being an elegant solution to delivering textbooks. 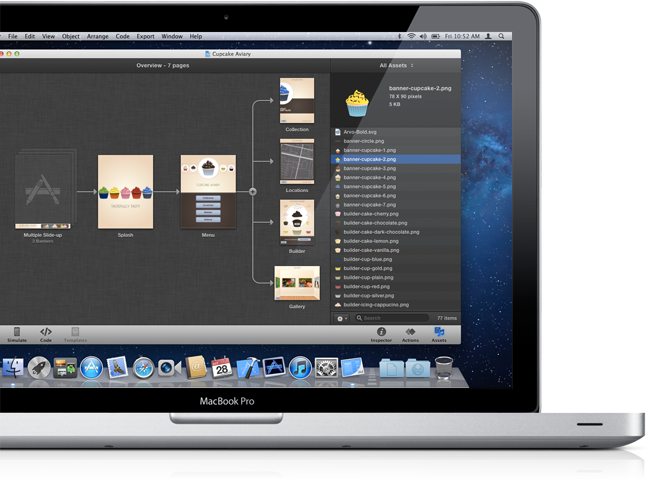 Apple does, however, already deliver a modern HTML5 web development tool for creating interactive content: iAd Producer. That tool is designed to create self contained, dynamic interactive experiences that are rendered as iAd content and distributed by Apple through third party iOS apps as a way to help monetize their mobile software. iAd Producer 2 is a visual designer for building iAd presentations that incorporate video playback, CoverFlow views, and other animated, interactive elements without knowing how to write code. Apple is also overdue for introducing new Mac OS X editions of its iWorks suite, making it likely that it could soon unveil a new version of Pages with enhanced EPUB support (keeping it up to date with the latest advancements of the EPUB open specification), or alternatively, augment its next version of iWork with a new title based upon iAd Producer but optimized for creating interactive EPUB documents and web apps. Apple also has yet to deliver a version of iBooks that can display iBooks Store and other EPUB content on its desktop Macs.